Macbeth Macbeth Synth overview / überblick..
very flexible and very cool starting point to a modular system.. it looks quite ARP'ish but it is not a clone or something.. it is something new, Ken Macbeth simply likes the design.. it has 2 filters . they also sound different..
its really between them all..
2 LFOs estimated to range to about 20-25Hz..
too slow? well, you got 3 VCOs!! all can mod each other .. very flexible system with lots of pre.routed bidirection mod sliders.. it is LARGE, and you can see what you are doing.. it also has a reverb spring..
this one sounds beautiful. 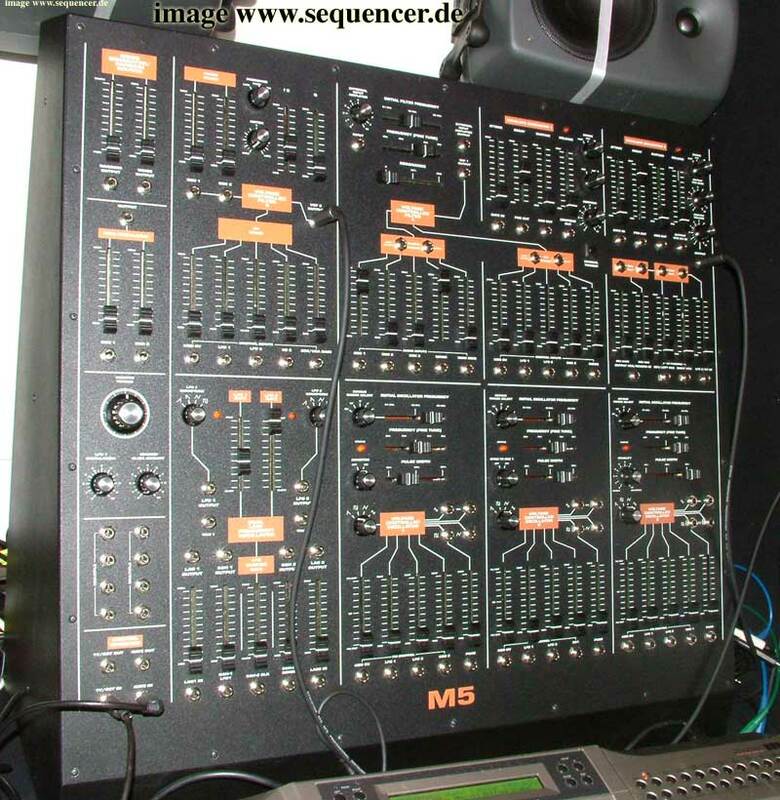 I first listened to it on the music fair in frankfurt 2005..
the final M5 synthesizer - enlarge? click on it! 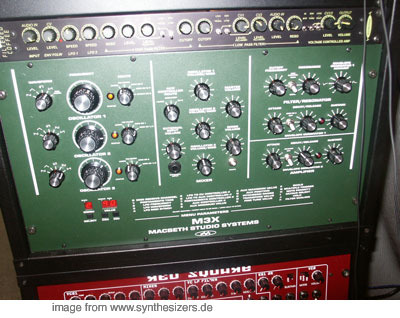 reminds a lot of a modern ARP2600 since there is also a spring reverb (!!) . 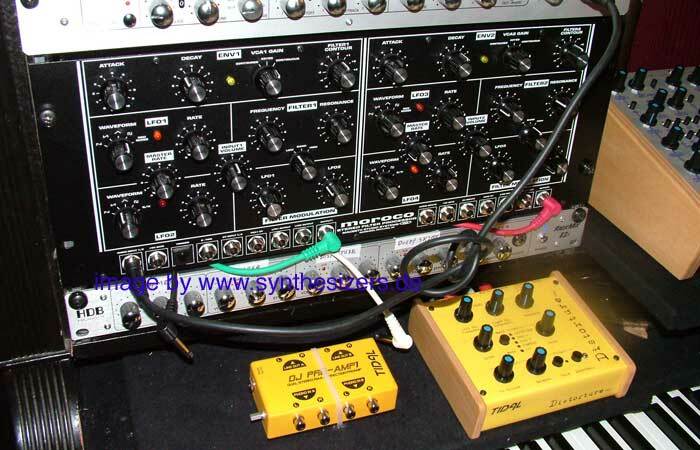 but it ISN't an ARP and it is NOT designed to sound like one! 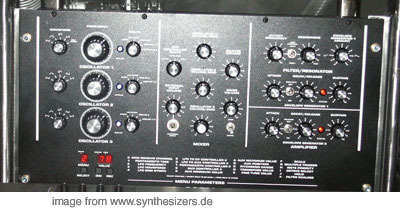 the lfos got LAG processors and S&H and all standard waveforms. the final prics is 2847,33 euro in GBP it is 1995 in the UK, in germany I assume a bit more than above since this is only calculated todays (11.11.2004) GBP->EUR price. in fact the germany price is 3490,- € !! anyway it has EVERYTHING you need to start with a modular systems.. the mp3s on macbethstudiosystems.com site sound quite promising in quality..
no idea how fast the LFOs are.. ;) but the ENVs got 3 level speed switch so maybe there is hope for fast envelopes..
there is a seamless slider for noise (white - pink) and some pre-routed sliders for quite some hard patched "cords"..
new 3 VCO synthesizer ( or is it synthesiser ? ), all ranging 32´ to 2´, all PW/PWM able. hard sync 1-2,1-3 or 2-1! patchable,so easily make FM sounds here! including subosc (subosc) per VCO!! 2 LFOs with 3 range switch (so this is perfect for very hi and very low frequencies..
maybe something like our quadLFO..
quite "minimoogish" look.. envelopes (2x)..
enlarge pic, click on the image! this quite look like minimoog? but it isn't a minimoog.. it has it's own sound..
cool freq. knobs (endless!) that allow some sort of EMS type VCO freq. tuning. "laboratory"-kind of quasi-"endless" dials! ENVs: is standard but not as fast as the mini's.. anyway anough to make nice percussive sounds, but maybe this could be moded someday?.. very nice user interface, and THIS is maybe why the ppl compare it to a minimoog: it's layout and knobs are at the right position and extended at the right features.the LFOs are all controlled by the digital interface. that could have been knobbed,too (well,one LFO with push buttons, amount knob and destination knob are missing.. but: you do have something like this using the display.. but it takes a bit more time..
anyway this is a really cool machine. 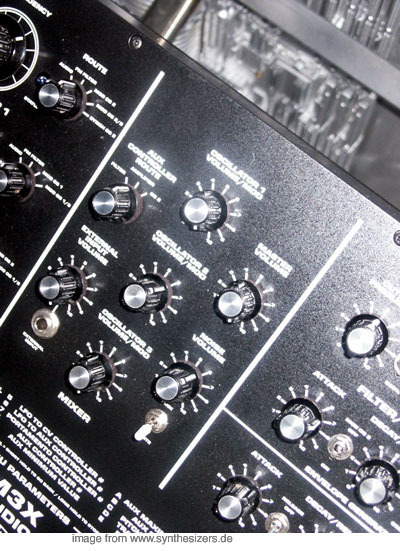 the highlight here is def'ly the FM and the OSC knobs!! in combination with the routing. 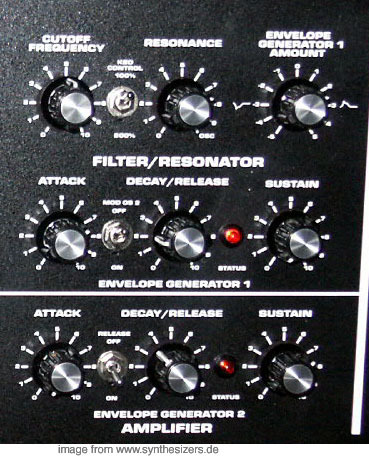 filters: sound a bit between EMS and moog .. but it is still another type of filter..
did I say it's LPF? seems they have CV in,out,CV CVF in, audio in and trigger in on the front panel now. OSCs impreoved ,too.. and now AC OP amps used instead of DC (thats what their site says..). why moog? well it's been said.. maybe because of the look of the m3x..
the M3X filters are far from moog..
at higher resonances it "thins out" a bit, sounds something between, uuhm, ems and moog?.. thats really only "somewhat close".. it also has it's own sound.. the envs are minimoogish small ADS(r)'s: means you need to set the release with the decay knob,too or switch it of (no release) this is for the AMP env. the filter env has always release. the overall sound is very nice.. the only odd point may be the slow envelopes: 5ms minimum (minimoog: around 1ms) . btw: you can do a lot with filter fm and the oscs, they are stable enough to do "DX7" sounds with inharmonic spectra etc..
this one is a very recommendable machine, there is 1 LFO that can be routed anywhere with 9 waveforms .. but this is the more critical thing: it's more like programming an old poly 800 or matrix6, you need to set them all using the menu unter the knobs..
the conclusion for me was: nice sound that is brought ("fat" = "phatt") enough to kick out an ems vc3 (yes ,the osc FM stuff reminded me of the ems!). 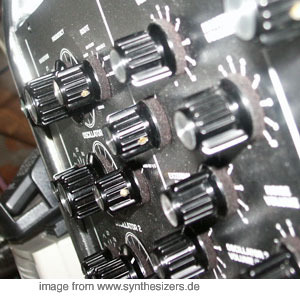 the filter is not a moog maybe somewhat "british".. the truth is: it is another kind of filter sound that is a good alternative to the mentioned synths (ems and moog) it's more the concept that made me "compare" those..
the M3X at the messe 2003..